My silence over the past few weeks does not indicate a dearth of activity. Rather, there’s been altogether too much until this week — too much non-work activity, that is. Including being sick, ultimately diagnosed as walking pneumonia. (All that means is that I’m feeling cruddy but am still walking around.) Still, I’ve managed to move some new work forward. See? That’s the second of the Precious Metals scarf series — silver. The first is gold. This is the warp on the back of the loom — a fine rayon flake hand-dyed in subtle earth tones. Makes me very happy to work with. And since I took these pictures (a few days ago), I’ve gone on to begin the third scarf on this warp (there will be four total) using a soft taupe weft. (Don’t know what metal is taupe-ish, but I’m sure I’ll think of something.) All these pieces are getting a full elaborate yet subtle patterning which will shimmer beautifully when draped around someone’s lucky neck. It’s messy right now, but won’t be for much longer. A very fine rayon slub, three colors, doubled threads to blend the colors. 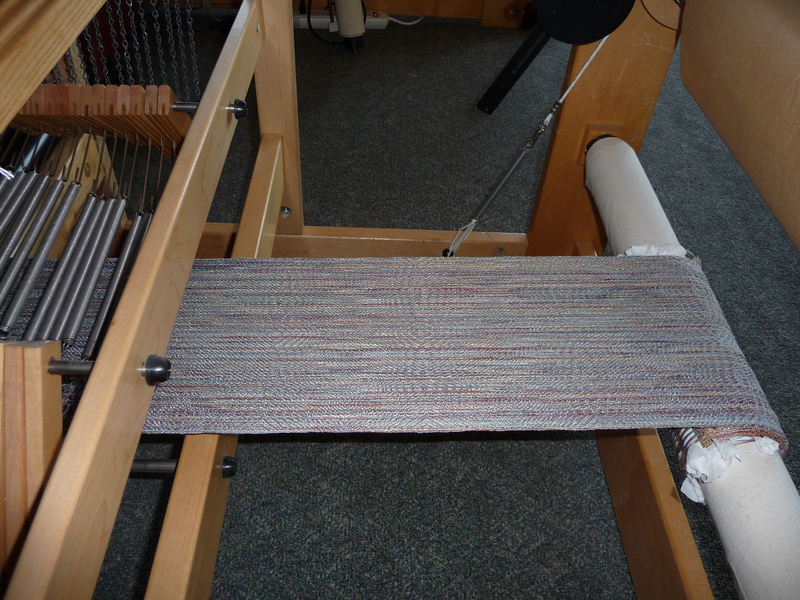 I prepared this warp in March of 1995. Really. It has waited all this time to be unpacked from an anonymous bag and put to a use other than that for which it was originally intended. 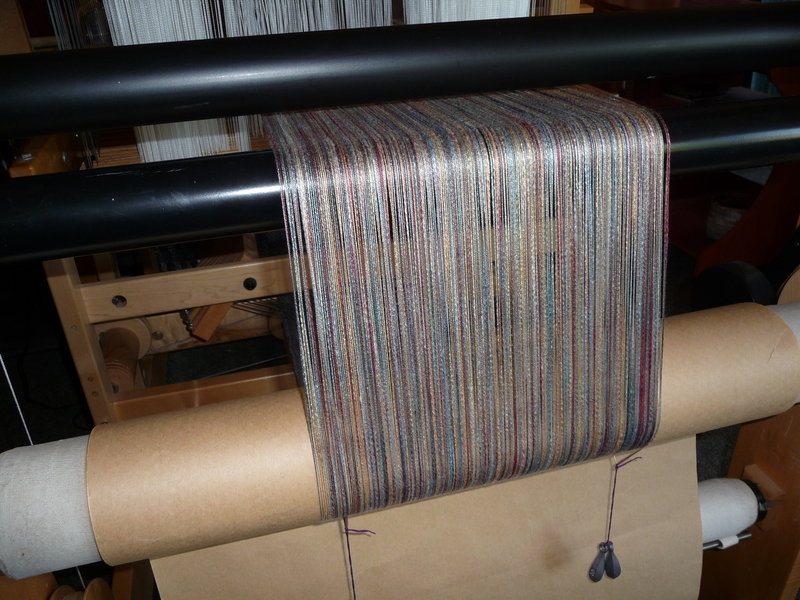 It’s thirteen yards long, and will produce five lightweight shimmery shawls, perfect for cool summer nights. 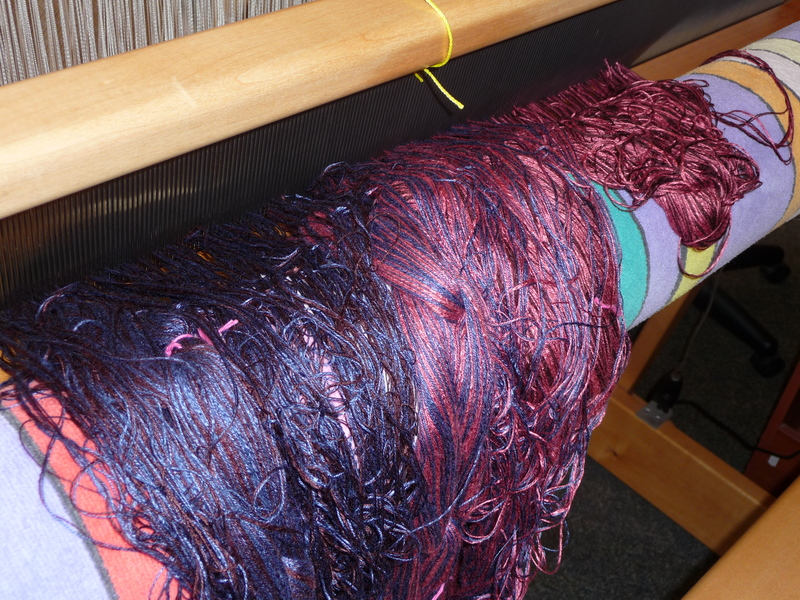 These too will have elaborate patterning, and be woven mostly with tencel weft yarns. You’ve only had the warp since 1995? Not that long – not compared to my unfinished quilt that was started in 1969. When I retire. . .
You’ve only had the warp since 1995? Not that long – not when I think of the unfinished quilt I have stashed away that was started in 1969. When I retire. . .